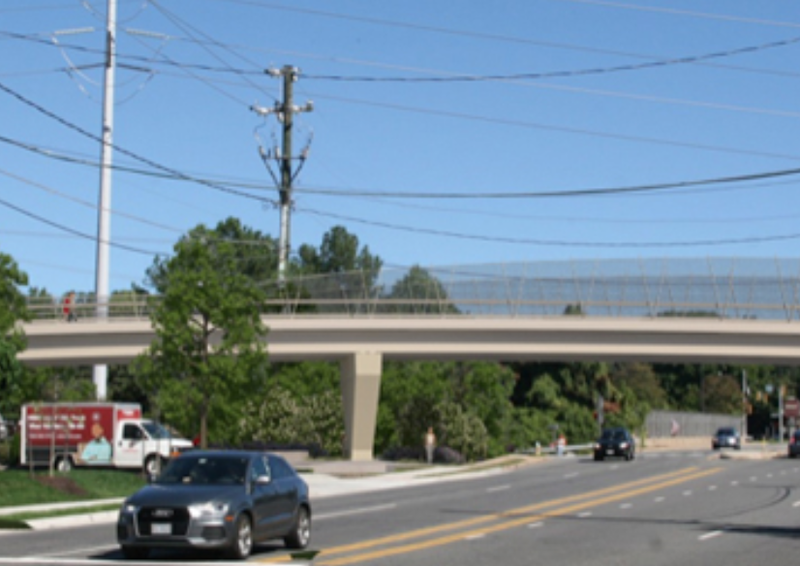 The ongoing projects for the I-495 Tysons Pedestrian Bridge, Mount Vernon Memorial Highway Trail, Transform I-66 Outside the Beltway Regional Trail, and VDOT Summer Paving and Restriping Program. The repaving program added over 30 miles of on-road bike facilities this year, bringing the total to more than 90 miles of on-road bike facilities since the program began. Three Safe Routes To School-funded sidewalk projects under construction or in design. The April 2018 Street Smart Pedestrian and Bicycle Safety Media Campaigns. An April 2018 pedestrian safety enforcement campaign with the Fairfax County Police Department in high pedestrian crash areas countywide. Bicycle parking added at several bus stops on Little River Turnpike in Annandale and the upgrade of existing bike racks to meet County design guidelines at the Patrick Henry Library and the Sherwood Library. The completion of the design of “Bike-and-Ride” facilities at Phase II Silver Line Stations and at the Springfield Community Business Center Commuter Parking Garage. The installation of bicycle wayfinding signage for the Franconia-Springfield Metrorail Station, and along the Fairfax County Parkway Trail. Finalizing of the locations of Phase II of Reston Bikeshare, which will add 11 more stations to Reston with a majority of those stations located south of the Dulles Toll Road. 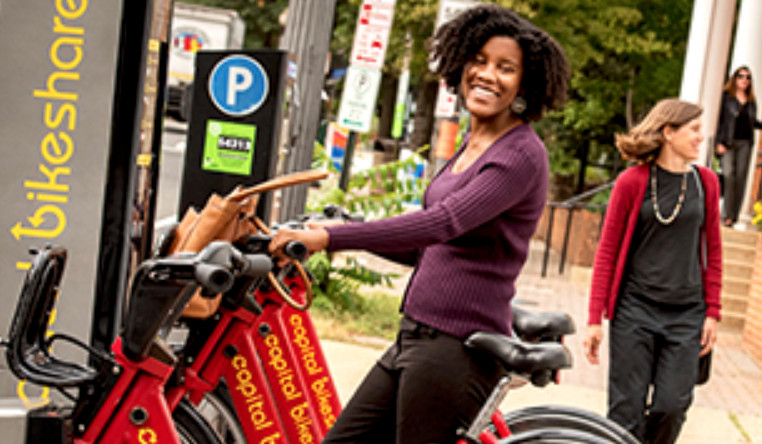 In addition, preliminary discussions with businesses in Merrifield are underway to place bikeshare stations around the Mosaic District and at the Dunn Loring Metrorail Station with the support of private funds. Mosaic District will launch with seven stations in this fall. Fairfax County expanded 2018 Bike to Work Day pit stops at which it participates from two to seven, serving residents in McLean, Chantilly, Lorton, Annandale, and Huntington. Learn more about these and other important multimodal transportation projects at the FCDOT website here: https://www.fairfaxcounty.gov/transportation/news/t31_18. There is still plenty of room for riders on the tour of Reston this Saturday, Oct. 13. The ride will leave from The Bike Lane's new location on Sunset Hills Rd at noon and return around 2pm. The ride is 15 miles with a few hills. We'll check out some of the new bike lanes installed during this summer's paving program. After the ride you can join The Bike Lane's grand opening celebration at their new location and the ribbon cutting for the new W&OD Connector trail. You could even sample the beers now brewed on-site. You can register for the ride on Eventbrite. The first of three public meetings on the Fairfax County & Franconia-Springfield Parkways Alternatives Analysis and Long Term Planning Study will be held tonight. 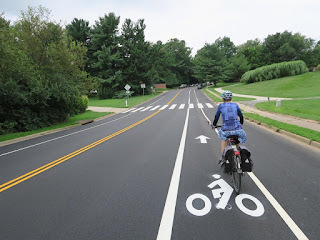 Fairfax Co DOT wants input on future corridor enhancements for the Parkways, based on residents’ personal experiences and desires for multimodal access, connectivity and overall operations. You can also send feedback to the project team via a form on the county website. 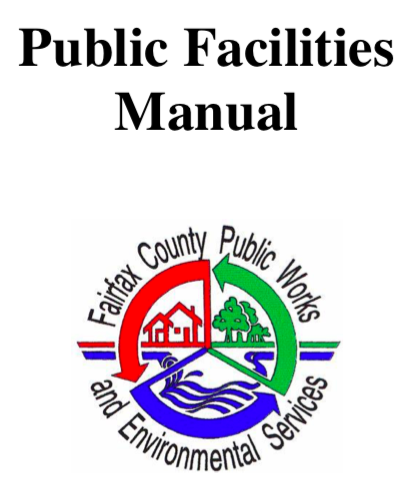 Fairfax County is modifying the Public Facilities Manual. 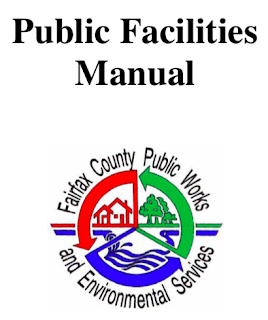 "The Public Facilities Manual (PFM) sets forth the guidelines which govern the design of all public facilities which must be constructed to serve new development." Guidelines include specifications for trails and sidewalks. Also included are bike parking requirements. Changes will be made in two phases. There will be a public hearing on proposed changes in Phase 1 at the Planning Commission meeting on October 18. For more information on the proposed changes see the Public Facilities Manual Flexibility Project. FABB has briefly reviewed changes affecting bicyclists and pedestrians. We are encouraged to see new text in Chapter 7 (7-0602.5) that refers to bike parking: “Bicycle Parking. 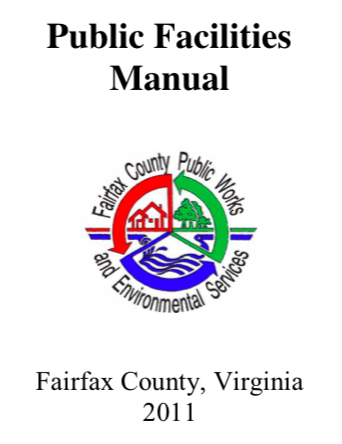 Bicycle parking must be consistent with the Fairfax County Bicycle Parking Guidelines.” However we don’t think the wording of those guidelines is strong enough. We suggest that the wording of the bike parking guidelines be strengthened and incorporated into the PFM during Phase 2. Chapter 8 contains sidewalk and trial requirements. Proposed changes are relatively minor. However, the Bicycle Master Plan should be referenced and added whenever the Countywide Trails Plan is referenced since both contain trail requirements. Other changes may be proposed under Phase 2. FABB plans to track proposed changes under Phase 2 and participate where possible in stakeholder meetings. If you would like to be involved, contact us. You can also submit comments to the Planning Commission or attend the Planning Commission public hearing on October 18 at 7:30 p.m. at the Fairfax Co Government Center. VDOT is planning to widen Fairfax Co Parkway between Route 29 and Route 123. The parallel bike trail diverts from the parkway in this section between Burke Center Parkway and Route 123. As part of the project a new trail will be built to fill in that gap. 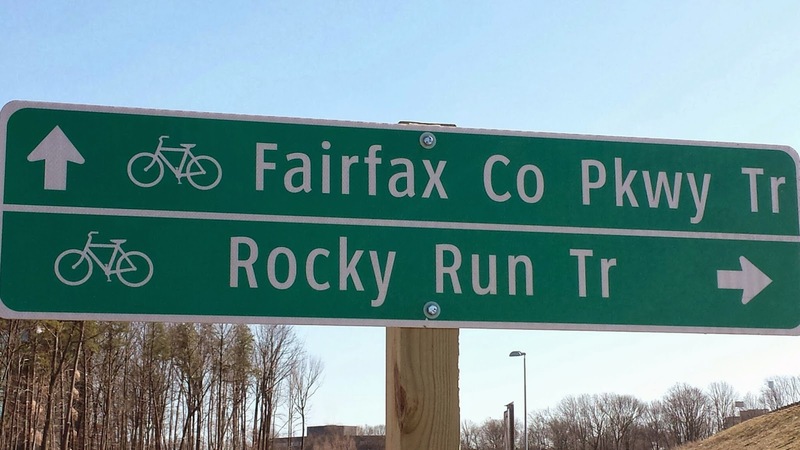 According to VDOT, "In addition to the roadway widening, improvements will be made to the existing Fairfax County Parkway Trail. Where there is no trail currently, a new shared-use path will be constructed to make the trail continuous within the project limits." While we believe VDOT is committed to improving the trial, it will help if a few people write in support of those trail improvements. Comments are being accepted until October 15. 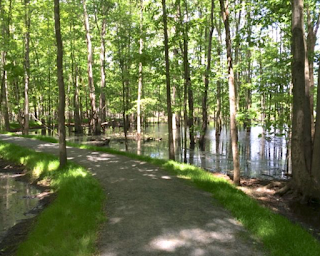 Please consider writing to VDOT to support the proposed trail improvements. If the above link does not work, the email address is http://meetingcomments@vdot.virginia.gov. Use the Subject "Fairfax County Parkway Widening". FABB is proud to be a co-sponsor of this year’s Tour de Mount Vernon. 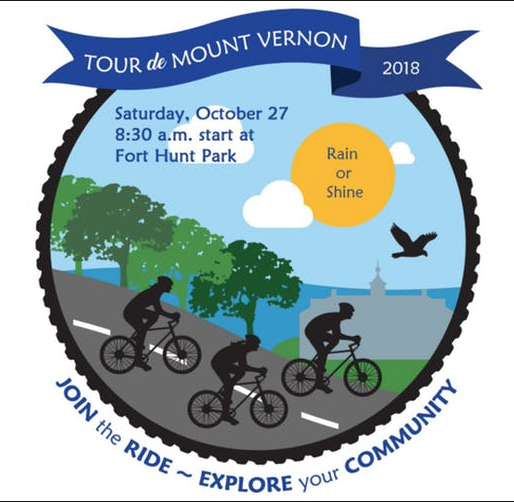 Beginning and ending at Fort Hunt Park, we will take a scenic tour of the Mount Vernon District. Riders will have the option of riding the full 32-mile route or a shorter 17-mile loop. Ride highlights include Mount Vernon Estate, River Farm, Gum Springs, the Grist Mill, the Pope-Leighy House, and more with full SAG support by Spokes, Etc. The ride will begin at 8:30 a.m. and will conclude with food, beverages, music and prizes! The fee is $25.00 per rider and includes Tour de Mt. Vernon Socks and a $5 donation to FABB. No walk-up registrations are permitted, so sign up here before registration closes on Wednesday, October 24, at midnight. Volunteers are still needed the day before and day of the ride! Log on to sign up here. Can you spare a few hours to help make bicycling better in our local communities? 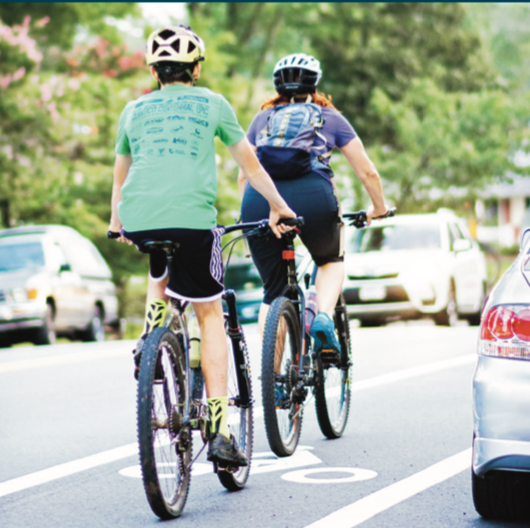 The Fairfax County Department of Transportation (FCDOT) is trying to qualify for funding for better bike infrastructure. To do this, they need bike counts and volunteers to help do the counting. To participate volunteers need to log in and sign up for the specific location, date and time through the Fairfax County Volunteer portal here. The name of the project is “Counts for state funding – Bicycle and Pedestrian.” Opportunities are currently available to participate on October 10, 11, 23, 24 and 25 in the morning and afternoon (times are location dependent and are listed in the volunteer calendar). If you live near these locations, won’t you please help FCDOT and your community by volunteering to do a bike count? And, if you can’t do a bike count, get some friends and family together and go for a ride past one or more of the eight locations. Bikeshare, E-Bikes, and E-Scooters, Oh My! The City of Fairfax is conducting a demonstration to educate the public on different kinds of shared vehicles at the city’s Fall Festival on Saturday, October 13. 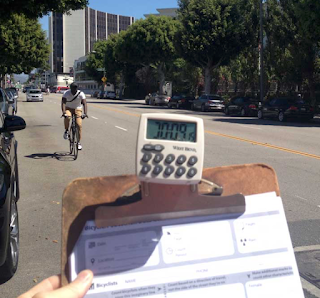 The demo includes a survey of people's views about a potential bikeshare program. If you have been curious about shared bikes and scooters as a transportation option, this is a great opportunity to see and learn about them. The city will have a couple of e-scooters and Capital Bikeshare bikes (including one of the new e-bikes) on hand. The city also is seeking volunteers to help staff its transportation booth throughout the day to assist visitors try the bikes and collect people’s opinions about bikes, scooters, and potential bikeshare station locations. If you are interested in volunteering for a couple of hours, please contact Chloe Ritter of the Fairfax City Transportation Division at Chloe.Ritter@fairfaxva.gov. We've rescheduled the rained out Reston ride to Saturday, Oct. 13. Ride with FABB to check out new bike lanes striped in Reston this summer. We will ride at a slow pace and stop occasionally to discuss the development of bike facilities in the county. We'll also point out some Reston points of interest. After the ride join the grand opening celebration of The Bike Lane's new Reston location and the ribbon-cutting on the new trail connection from their parking lot to the W&OD Trail. Ride starts at 12pm. The route is approximately 15 miles and the ride will take about 2 hours. Meet at The Bike Lane. Helmets are required and riders will be asked to sign a liability waiver before the ride. Register on Eventbrite. The Virginia Department of Transportation (VDOT) will host a community meeting this month to present the final design and aesthetic details for the Washington & Old Dominion Trail Pedestrian and Bicycle Bridge over U.S. Route 29 (Lee Highway) in Arlington. The trail bridge is being built as a component of the I-66 Inside the Beltway Eastbound Widening Project. It will separate trail users from motorists at the signalized intersection, enhancing safety for both. 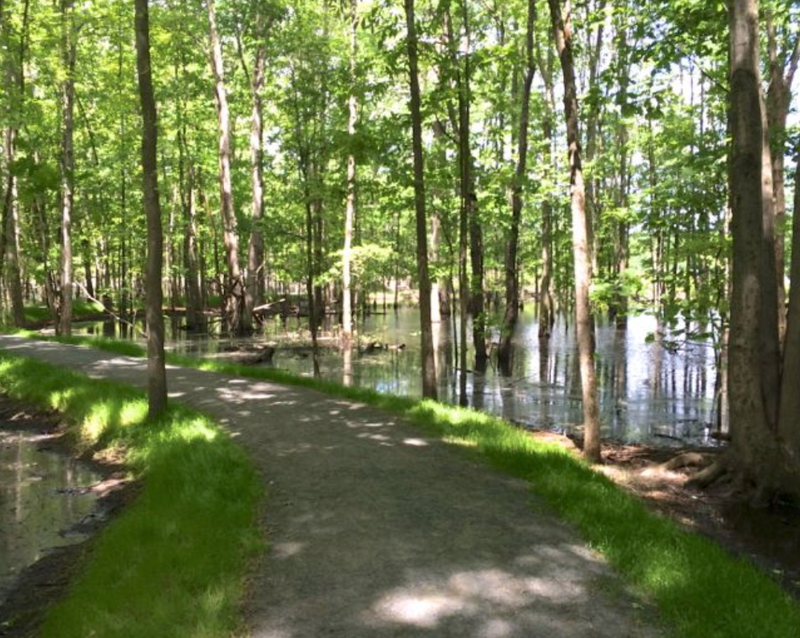 This section of the W&OD Trail serves approximately 1,500 trail users on weekdays, and over 2,000 on weekends. The meeting is set for Thursday, October 11, 2018, from 6:30 to 8:30 pm with the main presentation to start at 7:00 pm. It will be held at Yorktown High School, 5200 Yorktown Boulevard, in Arlington. Plan now to attend, show support for bicycle infrastructure, and offer your ideas to make the bridge even better. Fairfax County is conducting a long term study of improvements to Fairfax County & Franconia-Springfield Parkways. This is a followup to a short term study completed in 2017. FABB made extensive comments for that study, mostly about improvements at intersections. Possible long term changes include widening to 6 or 8 lanes and major intersection changes. The existing paved trail needs to be improved. At several intersections sight distances are poor. If the road is widened and bridges are built at intersections, the trail should be improved at the same time. Where the trail detours off the Parkway, such as at the I-66 interchange, the trail should be parallel to the road. The Fairfax County Department of Transportation (FCDOT) will hold two public information meetings on the Fairfax County & Franconia-Springfield Parkways Alternatives Analysis and Long Term Planning Study to seek input on future corridor enhancements for the Parkways, based on residents’ personal experiences and desires for multimodal access, connectivity, and overall operations. The meetings will begin with a presentation at 7 p.m., followed by a question and answer period at 7:30 p.m., and time for public input activities at 8 p.m. Both meetings contain the same agenda and format to allow for more community participation along the corridor. We did it! 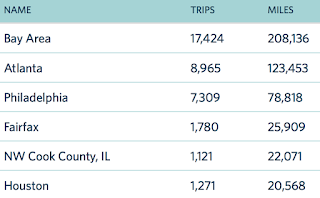 Despite one of the rainiest Septembers ever, Fairfax County cyclists participating in the National Bike Challenge finished strong and held on to fourth place in the National Bike Challenge. Sponsored by the League of American Bicyclists, this annual event seeks to encourage people to ride and to invite new riders to join them. 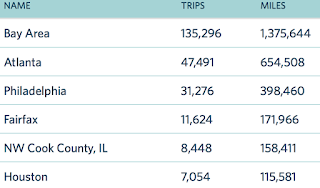 We began the month having ridden almost 147,000 miles since the challenge started in May. 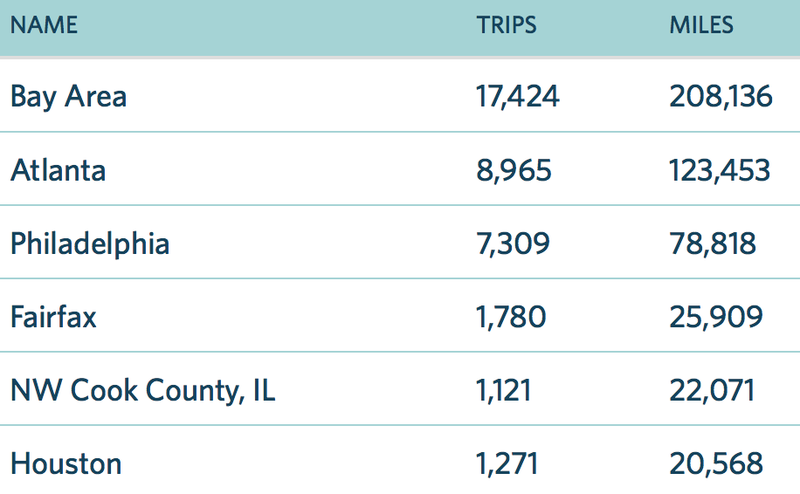 Fairfax County riders tacked on another 25,900 miles during 1,780 rides to bring our total to more than 171,900 miles. 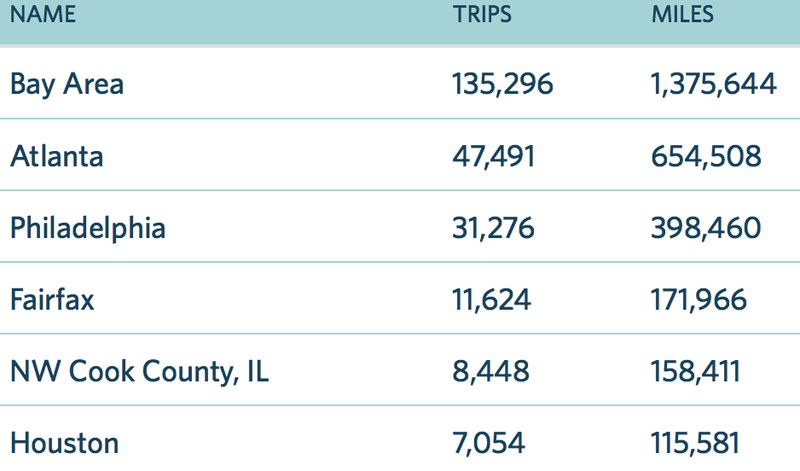 Fairfax County riders helped Virginia log 332,000 miles and place third in the country among states with populations of 8 to 12 million residents. Nationwide, nearly 113,000 bicyclists joined the challenge and took more than 5.5 million rides totaling just over 59 million miles. Congratulations to everyone who participated, especially the new riders. Even if you didn't win any of the available prizes, everyone won because biking provides health benefits ranging from heart health and improved immunity through better sleep to increased mental acuity and better mental health. So, do your friends a favor and keep inviting them to go biking. FABB doesn’t give up. We have twice had to postpone planned Mount Vernon-Lee District meeting. But, we persevere, and FABB is holding its October meeting on Wednesday, October 17, 2018, from 7:30 to 9:00 pm at the Sherwood Regional Library, Alexandria to talk about developments in these two districts. District Supervisors McKay and Storck have tentatively agreed to join us to share their visions for incorporating bicycling into the county’s transportation options. FCDOT will be there as usual to go into detail about ongoing and proposed bicycle infrastructure projects. Based on local interest, we anticipate a discussion of the county’s proposed removal of two bicycle trails from Huntley Meadows Park in Lee District. Please plan now to join us.